Trolley Bags are a system of 4 reusable bags that can help you pack your shopping in half the time at the Supermarket checkout. 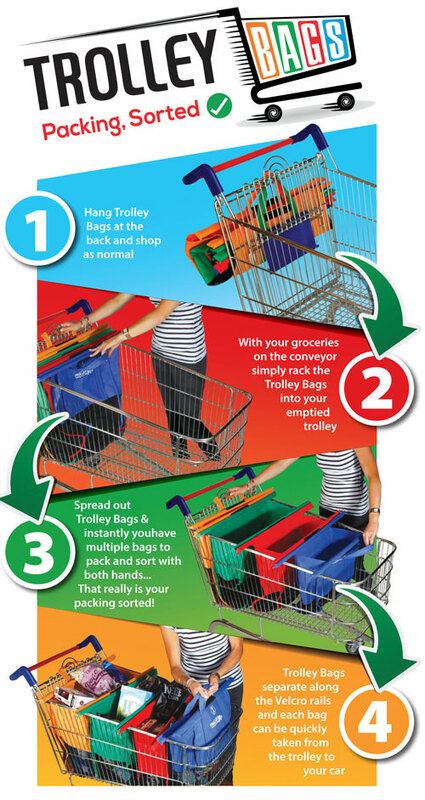 A simple colour coded system of 4 reusable bags that sit upright in all standard shopping trollies that allows you to pack your groceries the way you want at the checkout. It means you can get your shopping done quickly and pack in the way you want, so unpacking at the other end is a breeze. The 4 Trolley Bags fan out and stand upright in the shopping trolley, allowing you to use both hands to pack. Big items one end, small items the other end. It works in all the major stores including Aldi, Coles, Woolworths, IGA and any store that offers a standard metal frame shopping trolley to do your shopping. Have a look at our simple diagram to see the process in pictures. Check out the video at the bottom of the page to see it in action.